Fun House Theatre and Film, now in its 16th month of existence, has racked up consistently positive critical notice and full houses for its unique brand of honest, non-patronizing, non-schmaltzy youth theatre. Best known for its satirical originals penned by founding creative partner Jeff Swearingen, like ”The Ultimate Holiday Experience” or “Dracula, A Haunted Tale of Dating”, the troupe has launched itself into deeper, murkier waters with its current production of William Shakespeare’s “Hamlet”. Clocking in at slightly more than two hours with two intermissions, this production veers way far off the “kiddie theatre” yellow brick road. A serious production for youth through adult audiences who adore good theatre, including Shakespeare’s works, this “Hamlet” honors the text (somewhat cut down) and allows the actors to explore characterization with mature nuance and full arc. Is it National Theatre or RSC quality? No. But it’s valid, honest and vital. Palpable tension builds in the house as Hamlet’s frustration and rage grows at his own inability to exact revenge for his father’s murder. This “Hamlet” explodes with theatrical splendor in the final scene, most worthy of the Bard’s iconic work. The cast of seventeen ranges in age from 10 to 17, with most aged 12-15. Could YOU perform this play at that age? The only folks who shouldn’t attend in my viewpoint are under age 10 (LOTS of ‘big’ words and ‘adult concepts’) or those who might cough throughout the somber, thoughtfully paced performance (bring unwrapped lozenges, or please, do stay home). I can’t sing the praises of Chris Rodenbaugh as Hamlet enough, without beginning to sound like a close relative or his agent (I’m neither). Almost never off stage, he wrangles the complex, non-stop thoughts of a tortured, manic prince whipping himself into white rage fury as easily as he might pedal a bike. Jeff Swearingen directs his cast to simply allow the text and its sense to lead, without the grotesque facial, vocal or physical gyrations often exhibited by actors (some with stars after their names in show programs) trying to “sell” Shakespeare to a perceived uncomprehending audience. Rodenbaugh’s economy of expression, his maddening restraint in the face of pressing need for action, reinforces his character’s dilemma and makes his task as an actor focused, elegant. It’s extremely hard to take your eyes off him. A few wardrobe malfunctions opening night failed to derail him and did not interfere with the arc of the play as he incorporated them into the action with the grace of a real pro. Kudos to Rodenbaugh and director Swearingen. The balance of the cast supports Rodenbaugh 100%, with outstanding performances as well. 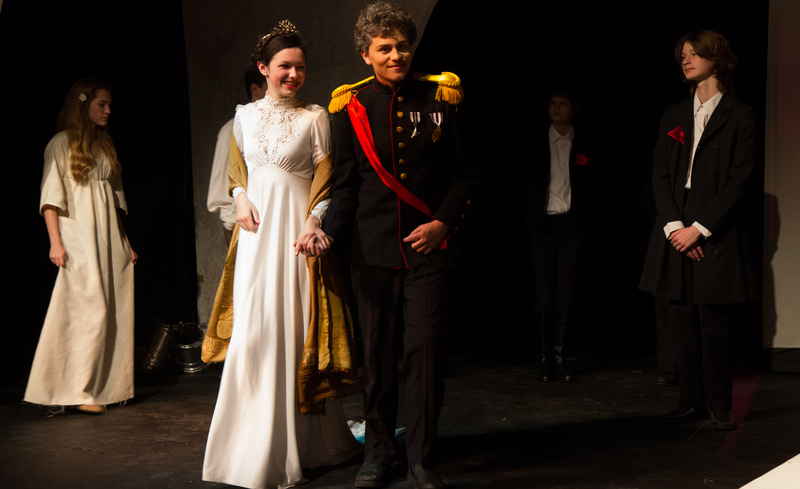 Doak Rapp (age 14) presents a politically savvy Claudius, at once dignified and kingly, yet increasingly on edge as he realizes Hamlet has recognized his deception and his demise grows imminent. 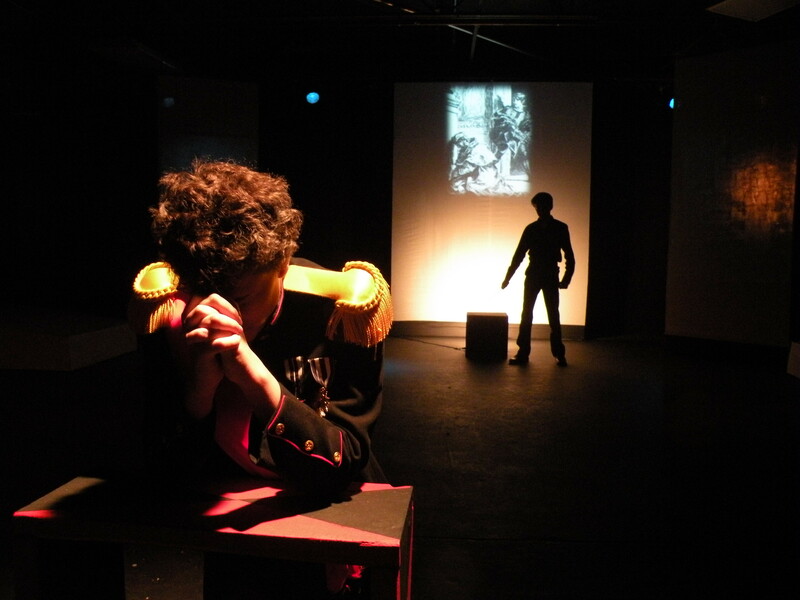 An often discounted and rushed, but powerful moment in the play, is Claudius’ prayer scene. Swearingen has placed Claudius downstage center, in full light, for his soliloquy, no mugging or hand wringing allowed. Rapp’s performance, filled with intensity and breathless, terrified reflection, communicates Claudius’ frantic desperation, his sense of becoming more and more of a haunted, hunted imposter, caught in a trap of his own sinister making. Again, economy of expression allows the brilliant text to shine through. When Hamlet sneaks in from behind him, clothed in shadow while savagely wielding a dagger, one fears for Claudius’ life, almost sighs with relief when the Prince turns away as “it isn’t right”, he can’t bear to “send Claudius to heaven”. It’s a defining moment, where set, lighting, costume, and both actors’ performances conspire to enliven the text in every horrifying, intended aspect. Madeleine Norton, age 14, makes a compelling, memorable case for a most queenly Gertrude, doting wife to Claudius and baffled, concerned mother to Hamlet. When Hamlet confronts her early on with the reality of her betrayal, her soul-felt shock and pain strikes to the heart of the audience. Later her revelatory description of Ophelia’s suicide is poignant, full of sorrow and utterly dignified. Washed in blue light downstage right, Norton delivers the speech in a stunned half-whisper that helps the audience imagine in lurid detail the scene the Queen has just witnessed and feels its impact. Exquisite and heartbreaking. Seldom have I seen Hamlet and Gertrude portrayed where it shows clearly how truly he is his mother’s son. 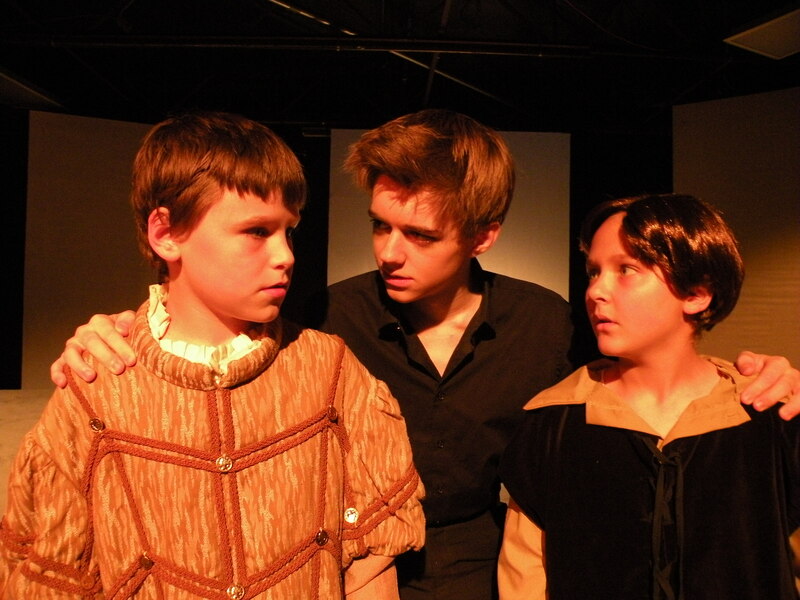 In the House of Polonius, Josh LeBlanc, age 14, portrays Polonius as a subdued and mature senior councilor to the King. Little attempt is made to disguise his age with Streaks n’ Tips or caricatured mannerism. Polonius often becomes the play’s prating buffoon; in Fun House’s production Polonius doesn’t ‘leer, bray or bare all’. LeBlanc’s Polonius remains a concerned father figure, caring for his children, bewildered by Hamlet’s irrational outbursts that lead to the older man’s unfortunate death. His daughter Ophelia (Taylor Donnelson, age 14) and Laertes (Cal Simpson, a high school freshman) avoid all semblance of preening, emotive grandstand performance in their gritty, realistic portrayals, exhibiting palpable grief to distraction or justifiable outrage. 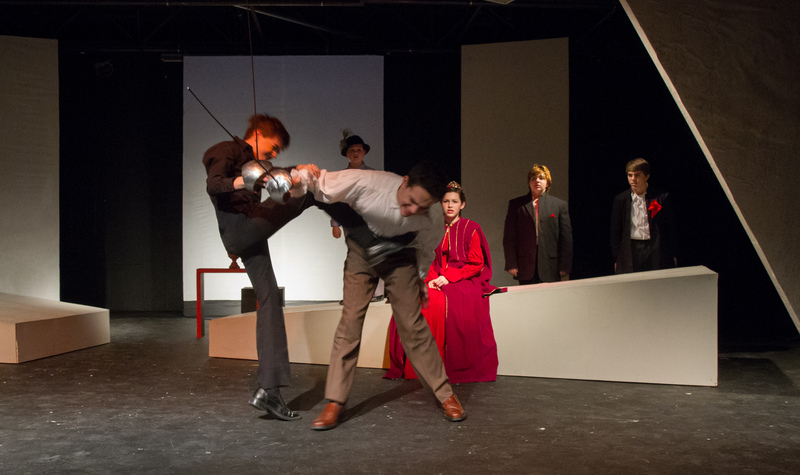 The final scene, the swordfight between Laertes and Hamlet, hurtles the play to a macabre crescendo of tragic mayhem largely due to the spontaneous-seeming veracity and ferocity of Simpson and Rodenbaugh’s carefully choreographed combat. It snatches the audience’s breath away (Mick McCormick, combat direction) and consummates the tragedy. Joseph Cummings’ simple, powerful set design centers on two rectangular, raked, interconnecting platform elements that actors re-arrange for different effect, scene by scene, and is flanked by sharp-edged vertical flats in monochrome hue. Together they reinforce the production’s somber atmosphere and the play’s themes. Severe but dreamlike, the overall visual concept emphasizes the play’s underlying savagery and haunting mental anguish. Upstage, projected slides rotate slowly behind the action, never distracting in any way, featuring classic artwork depicting scenes from varied “Hamlets”: by Delacroix, Fuseli, Wills, Millais and Cabanel. Cummings’ set design with slide projection, in balance with the haunting music score and shadow-enriched mood lighting (Cheney Coles and Chris Rapp) is one of the most effective, fully integrated set concepts I’ve witnessed in the region. And on a tight budget. I would be remiss if I failed to salute the dedication of work and time expended by construction “crew” Ben Bryant and Jacob Harris. There’s much serious Fun in this House of creative, inspired endeavor. Shakespeare’s “Hamlet” soars, like it should. The hard-working, very young actor troupe offers a memorable performance experience that will haunt them, in a positive way, all their lives. Honor them by attending their first-rate production. 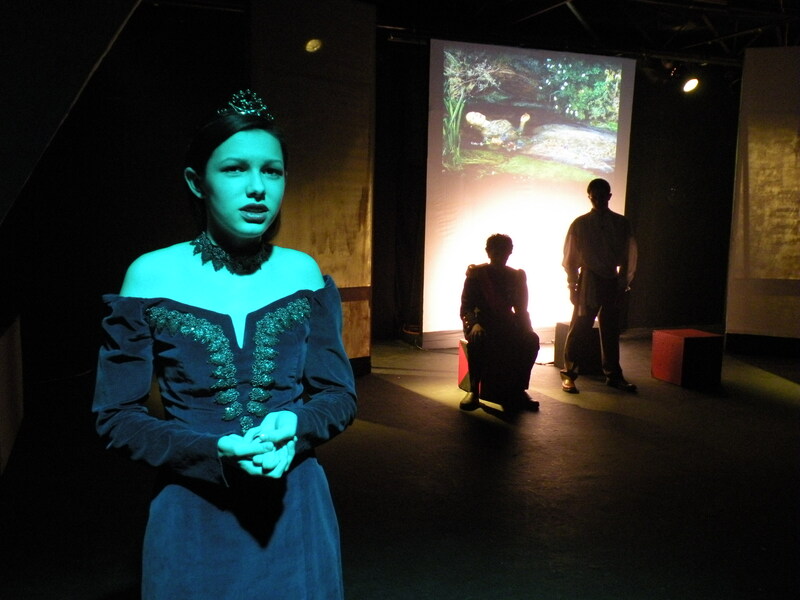 Fun House Theatre and Film’s “Hamlet” runs through March 3: Thursday, Friday and Sunday at 7:30pm, and Sunday at 2pm.